Venice City Hall is located at 401 West Venice Avenue, Venice, FL 33595; phone: 941-486-2626. Photo: Blalock House, ca. 1925, 241 South Harbor Drive, Venice, FL. Listed on the National Register of Historic Places in 1989. Photographed by User:Ebyabe (own work), 2010, [cc-by-3.0 (creativecommons.org/licenses/by/3.0)], via Wikimedia Commons, accessed February, 2014. Portions of the text below were adapted from a copy of the National Register of Historic Places' Venice Multiple Property Group nomination document. [†] Adaptation copyright © 2011, The Gombach Group. The area surrounding the present day city of Venice experienced limited growth during the second half of the nineteenth century. Economic and social upheavals associated with the Civil War and Reconstruction Periods retarded early development. Those few settlers who did locate here depended on stock raising, sugar cane and truck crops for their livelihoods. Although there was an awareness of the potential of citrus as a commercial crop, it was virtually ignored in the area until the 1880s. In 1882, Frank Higel purchased lands and established a citrus operation producing several lines of canned citrus such as jams, pickled orange peel, lemon juice, orange wine and "Pure Florida Orange Syrup." Higel's manufacturing operations were innovative due to the lack of rapid transportation for fresh fruit shipping. By the turn of the century, Higel had a successful enterprise that helped lure more settlers to the area. The erection of a saw mill in 1905 and the extension railroad service in 1911 firmly established the growing community. The settlement of the community progressed slowly, however, and it remained a small fishing and farming center through 1924. In 1925, at the height of the Florida Land Boom, Dr. F.H. Albee, an orthopedic surgeon, purchased 2,196 acres of land. Albee retained John Nolen, a world-renowned city planner, to design a city on his land. But before Albee had a chance to implement his development plan, he was approached with a proposal from the Brotherhood of Locomotive Engineers Union. The Union wished to increase its assets and holdings through the purchase of his land as the site of a proposed retirement community for its members, as well as for its general development potential. As early as 1904 labor unions were examining the concept of establishing labor banks to increase the retirement and benefit accounts of the unions. The movement, known as Labor Capitalism, was a marked departure from the normal practices of unions founded to secure fair wages and good working conditions for their members. The Brotherhood of Locomotive Engineers debated the issue of opening a labor bank as early as 1912, rejecting the proposal that year and in 1915, when it was again proposed. In November, 1920, the Union approved a move establishing the Brotherhood of Locomotive Engineers' Cooperative National Bank. This would be the first labor bank to receive nationwide attention. Within two months, the Bank reported $1 million in deposits, growing to $26 million by 1924. The Union extended its banking operations to Hammond, Indiana (1921), Minneapolis, Minnesota (1922), and Spokane, Washington (1922). It also opened regional securities offices in Oregon, New York, Alabama, Pennsylvania, and California. By 1926, the union had opened 11 labor banks, accounting for almost one-third of such institutions in America. In 1926, the Executive Council of the American Federation of Labor expressed concern "that interests not concerned either in the welfare of employers or employees but prompted wholly for speculative gains will...mislead well-intentioned workers and unions into banking ventures and security or investment enterprises that will spell ruin to themselves and cast discredit and disaster upon the organized labor movement." This concern was an apt analysis of the situation. Many banks in America were in financial trouble through bad loans secured with poor collateral. The Brotherhood Bank at Cleveland was among them. In 1925, it had extended loans based on $4 million worth of questionable collateral. Forced to remove this collateral from its assets by the United States Bank Examiners, the Brotherhood Investment Company and the Brotherhood Holding Company suffered a real loss of $4 million to the investment and holding companies. Looking to recoup the losses, union representatives responded to reports of the fortunes being made in Florida real estate. They looked to Florida for investment opportunities. In 1925, the union negotiated with Dr. Albee and a number of other local landholders south of Sarasota to purchase 30,511.31 acres with over seven miles of Gulf frontage for $4,023,092. The purchase was made public in September, 1925, with great expectations for the future development of the property. The Brotherhood of Locomotive Engineers Corporation was organized to handle the land and the Venice Company was set up to market and sell the property. At first the Union planned to market large tracts, but the idea was soon replaced by a plan to develop and build a city on the Gulf and to drain and develop small farming acreage inland. The company retained noted city planner John Nolen to complete a plan for a city on the Gulf: Venice. The company selected George A. Fuller as contractor, retained the New York firm of Walker and Gillette as supervising architects, and hired Prentiss French as landscape architect. The marketing of the development was handled by the Venice Company. The company was headed by a Mr. Carpenter who had worked for the Coral Gables Development Company. Salesmen were recruited and offices opened in New York, St. Petersburg, Fort Myers, Punta Gorda, Lakeland, Orlando, Clearwater, and Jacksonville. Meetings were scheduled in these and other cities through local representatives. Publicity packages were aimed at getting prospective investors to local meetings where introductory films were shown of the development. Promotions included direct mail, newspaper ads, window cards, and special stories. Local union officers and members of the ladies' auxiliary were considered primary contacts to induce potential investors to the meetings. Local bankers and civic clubs were also considered good contacts, as were members of the local Izaak Walton League and other fishing clubs. The agents were supplied with prepared speeches, registration cards for prospective buyers, and ready-made ads for use in local newspapers. Every resource of high pressure selling was invoked to stimulate the sale of property. Extensive and intensive advertising was employed. Descriptive literature, books, pamphlets, and pictures were made and widely distributed. Special writers and publicity men were secured, moving pictures were made and shown in the Florida picture houses. Buses, automobiles, and boats were purchased and sent to transport people to Venice. Parties were organized in Venice and entertainment provided. At the same time Venice was experiencing steady growth, the Florida Land Boom was faltering. A nationwide skepticism brought on by bad press, the hurricane of 1926, and over speculation all combined to deter new investors. Venice, like other fledgling communities, faltered. Although construction figures were impressive, they were well behind estimates. Stanton Ennes, general manager of the BLE Real Estate Company, noted in 1926 the "response was disappointing." The developers looked for a solution to boost lagging sales, and found it in two areas which were common to Florida developments of the day. The first of these was easy financing. The union did not undertake its own housing construction program, but encouraged outside builders. Builders were offered the opportunity to purchase lots with 25% down and were given a loan equal to two-thirds of the value of the building and the lot. Many builders were able to get the appraisal of their proposed buildings inflated so they could secure loans to cover their original down payment. This situation encouraged speculative building and is regarded as the main reason houses were built in Venice. Many times a builder did not have to put up any of his own money and could sell his house at a clear profit. The second tactic was to convince the prospective investor that the Union was behind the development. It is clear that, while special corporations were set up to shield the BLE itself from the risk of development, all publicity about the project centered around the Union's involvement. Statements from its officers were secured boasting the Union and its full financial resources were behind the development. Fortunately for Venice, but not for the union executives, this was an accurate picture. Unlike less successful Florida real estate deals, Venice had streets, sewers, and other amenities under construction and completed by the Union. This involved an investment of over $16 million by the end of 1927. By the end of 1927, however, the development had lost over $9 million and prospects for the future were unclear. As Venice began to take shape as a community, a definite feeling and character was established. This was the result of design review requirements set forth in all deeds stipulating the use of the Mediterranean Revival style in the plans for the building. The New York firm of Walker and Gillette was the supervising architectural firm given power by the Union to approve all design work prior to construction. The design requirements stipulated all construction would be in a "Northern Italian" design. This architectural style is more commonly called Mediterranean Revival style. In conjunction with the design elements of the built environment of Venice was that portion of the Nolen Plan addressing the green and open spaces along the wide avenues and boulevards. The City established a Landscape Department under the direction of Prentiss French. Having worked in the Northeast for many years, Mr. French came to Venice on a vacation and stayed on. He headed up a department that, in 1926, numbered fifty employees. Of these, several were individuals experienced in design landscape architecture. F. Paul Home, in general charge of the nursery and of the actual outside planting, was for five years the superintendent of the park commission in New Orleans and had charge of the nurseries and an extensive chain of parks in that city. 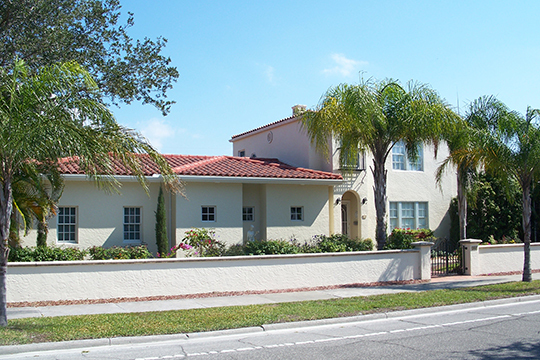 Home had previously worked for ten years in Oneco, Florida, with the Royal Palm Nursery. Also on staff were H. E. Heller, Ph.D. in landscape architecture from Harvard, and T. O. Ecperman, experienced in the architecture and engineering of designed landscapes. Indeed, rapid development produced a town of 4000 from a community of less than 100 a year earlier. By 1927, there were 188 residences, 141 apartment units and 83 stores. There were 13.5 miles of hard surfaced roads and 5.5 miles of graded roads. Even so, the growth of the development was slow and far behind projections of the union. Sales dropped steadily in 1926 from $500,000 in January to $101,350 in June. It returned to the January level in November, but steadily declined to a low of $50,000 by December, 1927. Every aspect of the project was operating at a loss during the two-year period including the golf course, three hotels, and the dairy farm. Controversy surrounding the management of the union's investments and banking activities surfaced at the July, 1927 annual convention. Poor performance of the banks and problems with Venice prompted the membership to vote a "lack of confidence" in the leadership. The union voted to place its financial affairs in the hands of the Board of Financial Trustees, the trustees visited Venice in August and were faced with demands from farmers, whose crops failed in 1926-27, for refunds of their money. They insisted the property was not up to the claims made in advertising. C.H. Huston, former Secretary of Commerce in the Hoover Administration, was hired as counsel and recommended out-of-court settlements. In September, 1927, Stanton Ennes was hired at a salary of $1,000 per month in an effort to salvage the development. He inherited a community beset with errant mortgagors, unhappy tenants, and slow sales. Development work had stopped and only two out of the five hotels were open. Stores, houses, and apartments were vacant. Many people were holding back principal and interest payments due to a lack of faith the company would complete the development. The situation was bleak in Venice during the early 1930s. City employees went unpaid and street lights were turned off for lack of revenue. Most of the unsold land reverted to Dr. Albee and other creditors in the 1930s. Slowly, however, the town began to pull itself up. In 1932, the Kentucky Military Institute bought the Venice Hotel and the San Marco Hotel as a winter school for its cadets. Although, the institution did not increase city revenues due to its educational tax exemption, the 300 students and faculty provided much needed income for the few remaining merchants. The following year, Dr. Albee purchased the Park View Hotel and established the Florida Medical Center in Venice. He assembled a medical staff and the Center developed into a successful teaching hospital. World War II had a major influence on many Florida cities, including Venice. Training bases were established in many parts of the state. Vacant land south of Venice was acquired by the U.S. Government in May, 1942, and the 27th Service Group was relocated to Venice from McDill Field in Tampa. In June, 1943, the 13th Fighter Squadron, 53rd Fighter Group was transferred to Venice from Fort Myers. Later the 14th Fighter Squadron also was moved to the field. They were operational training units for combat fighter pilots and ground crewmen. The Florida Medical Center was initially made available for use by military personnel in September 1942; eventually, it was taken over for the exclusive use of the military. The base helped to bring the community out of its economic slump, beginning with 900 men and eventually growing to 4000 with over 200 buildings. The post-war boom also brought prosperity to Venice. Developments in the 1950s produced a new boom with thousands of lots being sold and developed. Population increased in the 1950s and 1960s and hundreds of houses were built. Unlike many Florida cities at that time, Venice had a plan. The actual street plan of the southern portion of the city did not specifically follow the layout of the Nolen plan, but kept to it generally and development did not take place in a disorganized fashion. † Vicki L. Welcher, Historic Sites Specialist, Florida Bureau of Historic Preservation, Venice Multiple Property Group, nomination document, 1989, National Park Service, National Register of Historic Places, Washington, D.C.